True blogger confession: I love all those crafty, creative do-it-yourself projects on Pinterest and such…. but I just do not have an artistic eye. Or any style-sense whatsoever, actually. 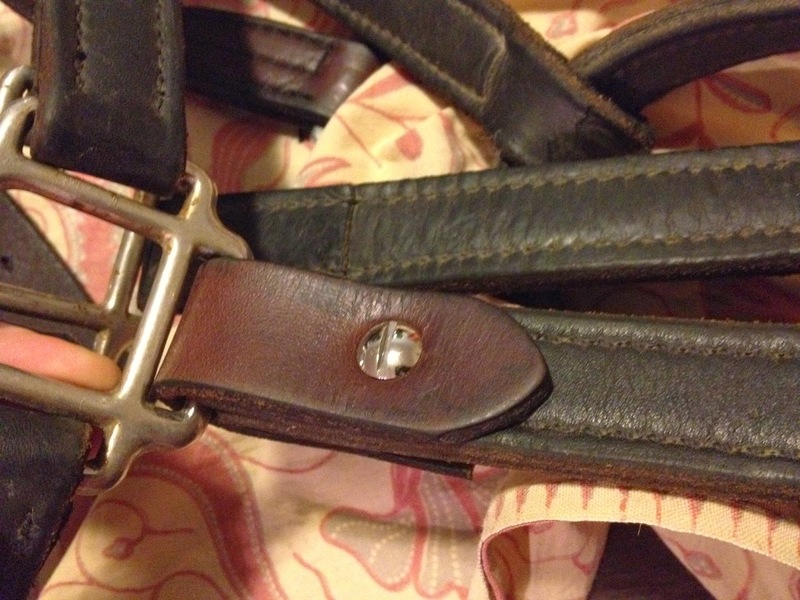 That’s right, yours truly was able to do some basic leatherwork and thus extend the usable life of a halter. It’s a big day. So the halter broke at the show at 2 places: where a cheek-piece attaches to the nose band, and at one of the crown-piece buckles. Apparently this latter piece is where most halters break because you can find replacement “breakaway” pieces online for ~ $4. But the cheek-piece? I couldn’t find any type of replacement online or in the tack store. 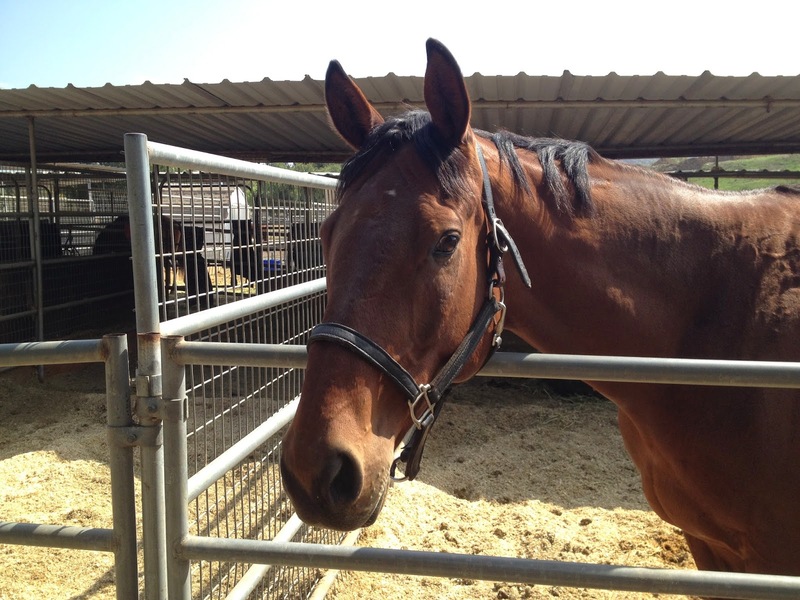 The tack store quoted me at $20 to $30 for halter repair, which sounded steep to me. Online tack repair was cheaper…but not once you factored in shipping. 1 Leather hole punch ($8, though I could have looked for one at the barn). Chicago screws (I bought 2 bags of different sizes, each for $4). Heavy duty scissor (I used an old cooking shear). Old stirrups…not just for jump straps anymore! Clean, condition, and cut leather. Use Chicago screws to secure the leather together. 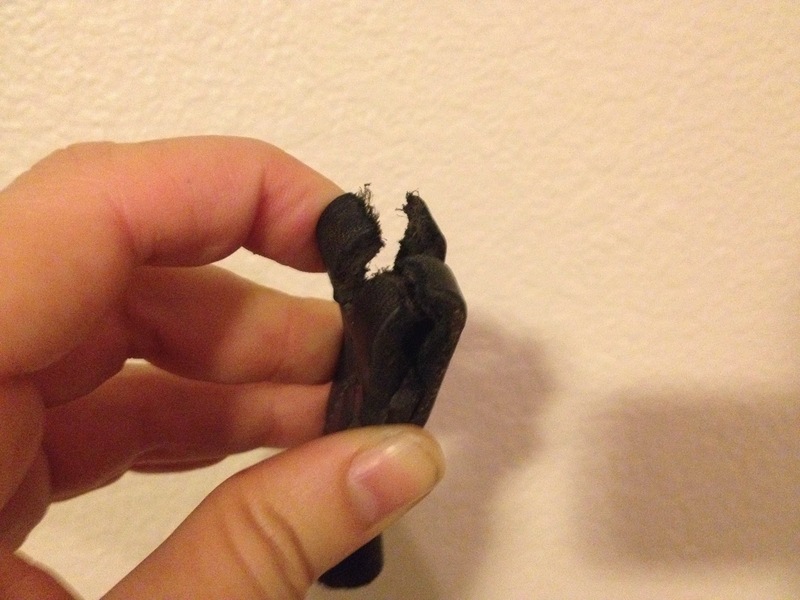 Basically, I took a short piece of leather and wrapped around the cheek-piece, through the noseband ring, and secured it back onto the cheek-piece from both sides using the screw. 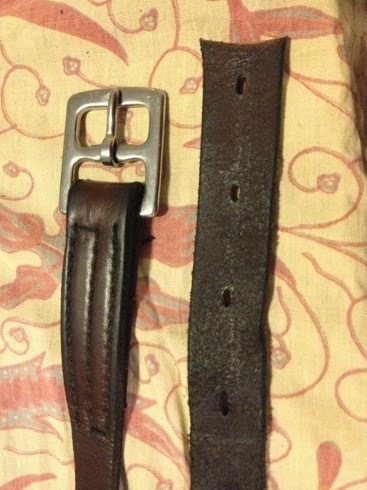 Replacement buckle piece from old stirrup leather! 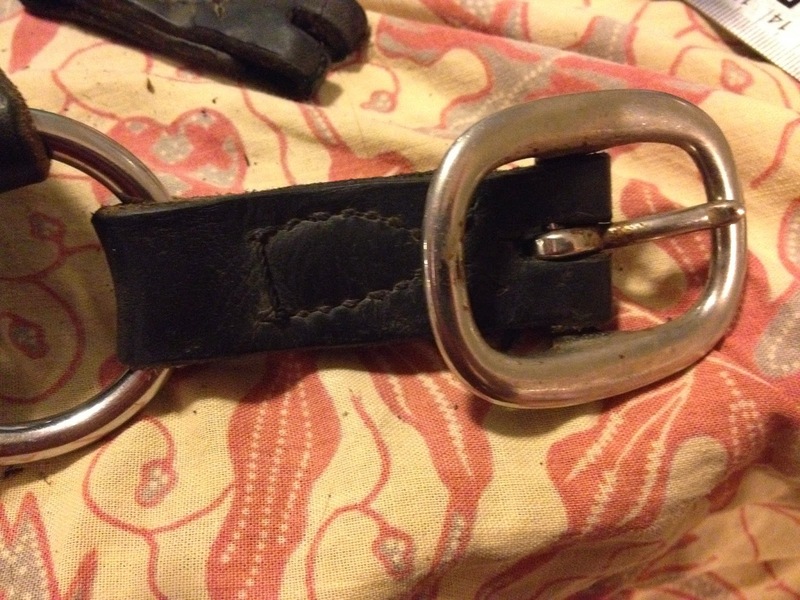 An 8″ long piece of leather is bent into an S shape, with one end looping around the halter’s side O-ring, and the other end attached to the buckle, then bent into a full 8 shape and secured with one Chicago screw. On the right hand side of this picture, you can see I used the hole-puncher to make a gap in the middle of the leather. The buckle’s tongue sticks through here so it can move open and closed. Full disclosure: following the show I immediately went to the tack store and purchased a new leather halter for everyday use. 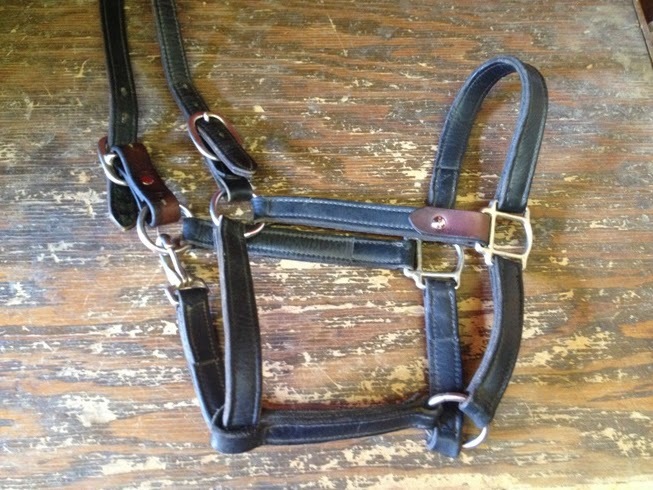 This repaired halter is now my back-up halter. Which you can bet I’ll be bringing to every.single.show.or.outing. from now on. 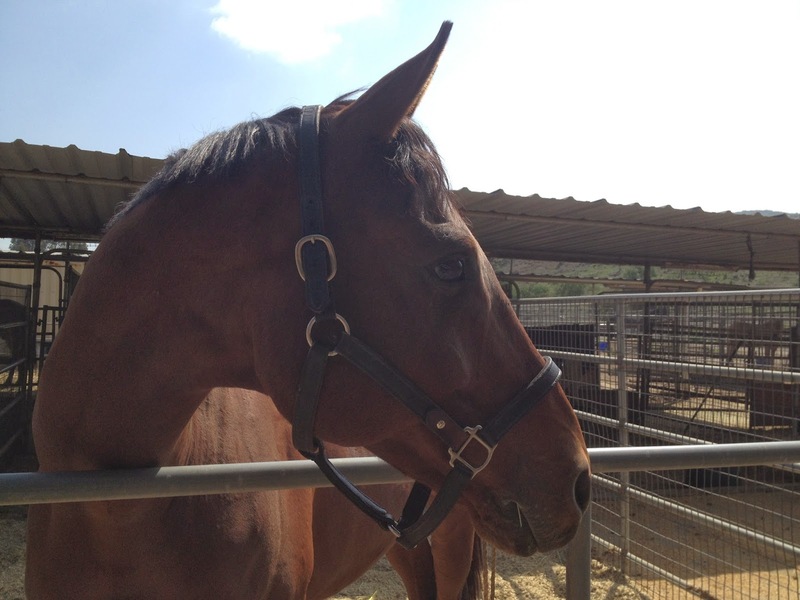 Come fix my halter, I am too lazy! 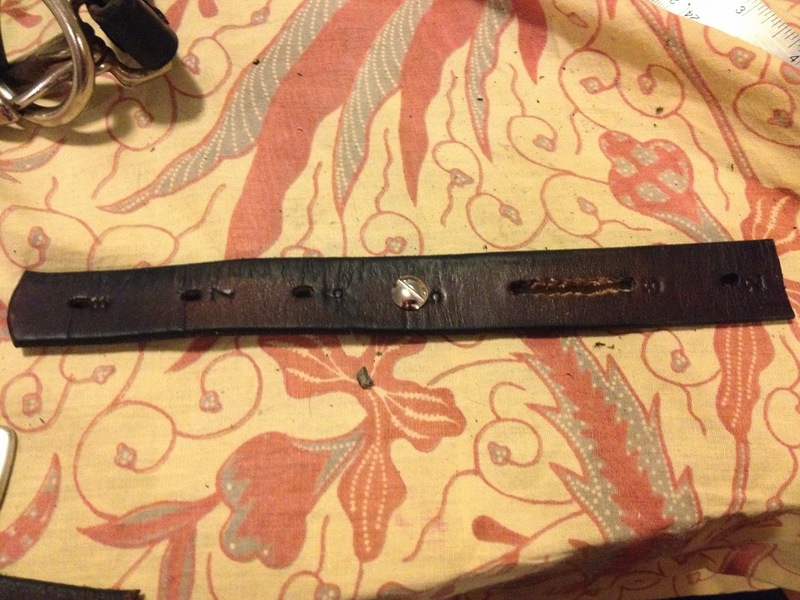 Email me a photo of where it's broken and I can let you know if I think I can fix it (zero guarantee of my leather matching though, lol). And if you pay the shipping costs, I'll fix it for free. Oh you're way craftier than me! Wow, talk about getting your monies worth! Nicely done too.